Our version of a Hnefatafl game using game pieces inspired by a surviving sheep bone game piece found in Oxfordshire, England. "Tafl" games are said to have been played by Norse cultures as early as 400 A.D., and were imported by the Vikings to Iceland, Britain, Ireland, and Wales. They were the primary strategy games in Northern Europe prior to Chess. 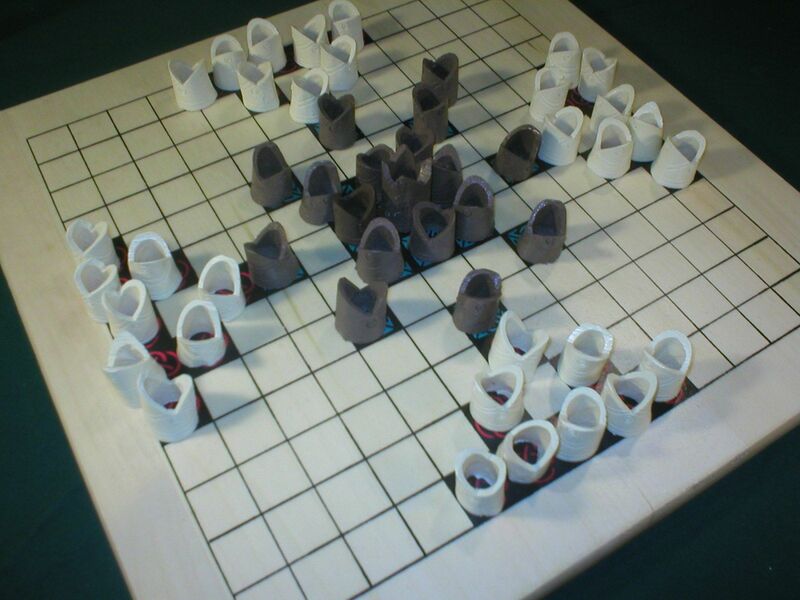 Unlike Chess, or Checkers which are fought by equal armies from opposite sides of the board, "Tafl" games involve a single king and his defenders in the center of the board surrounded by a larger army of attackers. Our version is inspired by an unusual fragment of a game board found with the the 9th century Gokstad Ship Burial discovered in Norway. The board fragment appeared to have a 13 x 13 grid. Traditionally, surviving boards are fairly plain, but to make it easier to set up we have identified the starting layout with simple knotwork designs. The boards are about 3/4" thick and 16-inches square. We also include facsimile sheep knucklebones as an option for playing "Tawlbwrdd" a Welsh variation which may have used dice.